That poor monkey is getting his nuts blown with hot gases. @mfbull He does have his own paddock pass though. What is it with you people? 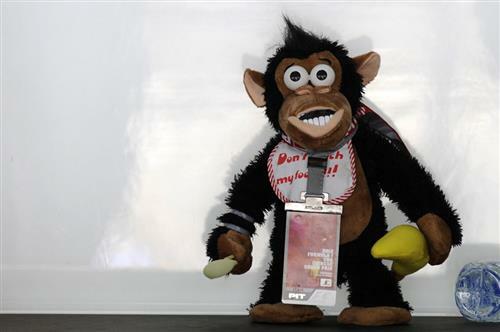 First seals, now monkeys, F1 is decidedly NOT green. Who thinks Kimi can be champion again. Maybe not this year but perhaps another year? @Alphaq, also you have to remember Lotus missed the first test last year, and look how there season went. Lisa Bentley - Definitely!!! I've got £10 on him winning this year! According to Auto Motor und Sport it's a fuel pump issue keeping Wehrlein in the garage at the moment. A bad day for the world champions. The timing screen of most recent laps reads - Maldonado, Verstappen, Maldonado, Verstappen, Maldonado.... you get the picture. Maldonado has now left young Max to go it alone, though. @LewisHamilton: The small carbon fibre wing situated either above or around the exhaust pipe. 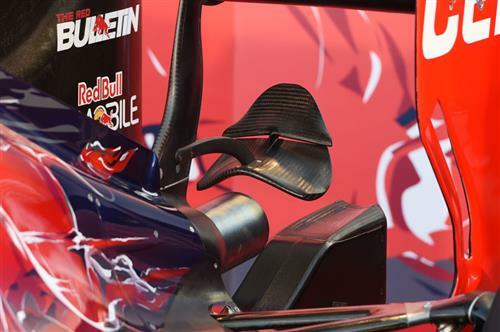 As seen below on the Toro Rosso. @TPH: If I could bet F1 this side of the pond, I'd put $100 on SuperMAX getting a podium. What other bets would you punters take? I really want to see Kimi at his true pace this year..
Who agrees with me that kimi is the fastest driver in the paddock? Maybe not the best (I think that honour goes to Alonso), but the fastest. @Sean: All of the F1 multiverse wants to see that. How long does an F1 helmet last any way? Are they retired after any incident, no matter how minor? @abudhabifan: It's not a cheap thing to do. Three of the four you mention have been involved in F1 in the last 30 years or so, but the costs, politics and difficulty of success are the main reasons they are put off (probably in that order). @Wedgeman: That's also true. The WEC and Le Mans have seen Porsche and Nissan join in the last two years and have much more open regulations if you truly want to build an innovative engine or car. @Laurence: When will ESPN and Disney open up the purse strings and get you guys making some insider videos à la Ted's Notebook. Do we need a poll or a web petition? @mfbull: We will have more video content on the site this year and some of it will feature Nate and I. We can't hope to compete with Mr. Kravitz and his SkyPad but we will have some more content to go over the main talking and technical points at the year progresses. Are there any rumors floating around about a possible Ford return as an engine manufacturer seeing as they are very familiar with turbo V6's? @JoshuaWright: Nothing that I've heard. Ford left under a bit of a cloud when Jaguar left the sport (the brand was owned by Ford at the time). However, that team turned into Red Bull and we all know what happened next. Never say never. @Wedgeman: I REALLY like those LMP1s. Wish they would run at the Daytona 24. Not sure why they don't...might be they are too fast for the road course, or the road course is too short to have such fast cars on there with the GTs and Daytona prototypes. @abudhabifan: I agree, the more the merrier. The new engine regs were supposed to attract new manufacturers. It's true that it worked with Honda but it also killed off Cosworth's F1 involvement. @Joshua: Probably see Ford at Le Mans first. The new benchmark a 1:25.011. I think Kimi might just be the fastest driver on the grid. I don't think Alonso is the best. He got beaten by Hamilton in his first year. We know how good Alo is in a non competitive car but its unfair to say he is better than Kimi. Kimi has also shown that he can deliver in an uncompetitive car but Alo has been in that team for 5 years and the car has been designed for him so i think it has suited him alot more and it was a dog of a car anyway making the job that much harder for Kimi. Had it been a competitive car I am sure the gap between Kimi and Alo would be less pronounced. Have you had a chance to see the cars out on the track yet? How are they performing through the corners? Which cars are stable and which aren't? Maldonado has just flashed past the media centre with the yellow-striped Pirelli's - meaning that last time was done on the soft tyre. @NikhilDuki: Nate is at the track this week, so we'll make sure he gets a chance to witness the cars in action. All told, it's been a bit of a scrappy day for on-track action, so hopefully he'll see a bit more later in the week and can report back. 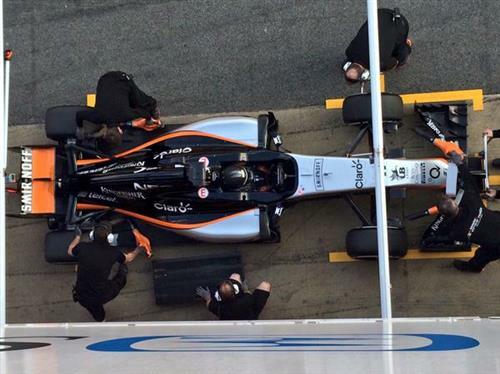 I think giving teams greater freedom in designing their cars will not improve the show. I can relate to what some call the "Golden Era" of CART, where in 95-99 they had 2-3 different chassis designs, and the show on the track was incredible. I don't support turning F1 into a mono-series, but I think tightening up the regs and leaving them unchanged for a few years is the only feasible recipe to improve racing. Your thoughts? @Yevgeny: It's an interesting debate, but I would argue that F1 has slightly different DNA to CART. So much of F1 is about individual constructors making the fastest cars to a set of regulations. Those regulations should probably do a better job at capping costs, but the innovation is key to the sport. Just look at the variation in something as small as the "monkey seat" that we were talking about earlier. I think that is still important for a lot of F1 fans. What's up with Mercedes? Why are both their driver's at the bottom of the list - both in terms of time and mileage? After a sizeable delay, Wehrlein is out on track hoping to add to his 22 laps for Mercedes this afternoon. Today has been far from ideal for Mercedes so far. @Uzayr: It's been a bit of a shocker for Mercedes. Hamilton woke up with a fever and after 11 laps decided he couldn't take anymore. Then the team had to set the car up for reserve driver Wehrlein, but after his first 20 laps they discovered a fuel pump issue. But... as Nate reports, Wehrlein is back out now. @Joshua: and there's the rub, until F1 brings back the eyeballs, corporate boards won't let the racers in the car manufacturers go racing.